Dystopian and post-apocalyptic YA novels are in vogue right now, in accordance with the flowing tides of the Zeitgeist. 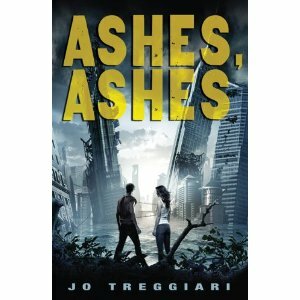 I’m writing one myself, which gives me an extra reason for reading and enjoying many of them… but for me, Jo Treggiari’s ‘Ashes, Ashes’ stands out. Yes, it’s about teenagers caught up in the aftermath of catastrophe – but lo and behold, there are older folk involved too. Yes, there’s romance: but Treggiari disdains the Hollywood approach. Instead of the gamine heroine with perfectly tousled hair, dressed in battle-chic and ready for combat, the book opens with 16 year old Lucy, dirty, sweaty and greasy-haired, crouched in her muddy shelter on the shores of what used to be Central Park, painfully trying to butcher a turtle. Sea-level rise and haemorrhagic plague have devastated the human population, and the survivors spend most of their time and energy trying to scavenge enough food to get by. Pursued by a pack of vicious dogs, Lucy is helped to safety by a boy called Aidan. When her camp is destroyed by a tsunami she joins his small community of survivors, only to discover that their shanty town is regularly raided by an army of ‘Sweepers’ who carry off children and elders to their headquarters and – apparently – experiment on them. The world of the novel is detailed, carefully imagined, realistically bleak, but with flashes of beauty. Lucy and Aidan feel like real people – ordinary teenagers caught up in something terrible, whose resilience comes out in humour, wisecracks, and ultimately in the sort of selfless courage it's good to be reminded young people - or any people - are capable of. I don’t know if there’ll be a sequel, but if you’re into post-apocalyptic fiction, this is definitely one to look out for. I have not got into dystopian fiction yet but my husband has been reading lots of books so it is only a matter of time. Ashes, Ashes sounds a good place to start. I mistakenly thought the title was Ashes to Ashes like the David Bowie song! Are the challenges similar to writing historical fiction Katherine? Well, it all depends how probable one wants to make one's world. Some of them, like Scott Westerman's 'Uglies' take a single idea for a ride: the cult of youth and beauty: and go on from there. Suzanne Collins' 'The Hunger Games' credits the (evil) goverment of a futuristic America with untold powers, which you'd better just agree to believe in, in order to tell a story of media exploitation which is way beyond anything that's ever likely to happen. You can regard thse books as satire, as warnings, as the basis for discussion of some modern trends, or as jolly good adventure stories no less credible than 'King Solomon's Mines'. How much effort an individual writer puts into the 'science' and the background of the story, as ever, differs enormously. But I liked the care Jo Treggiari takes to flesh out her world. This sounds interesting, Kath! I read somewhere (on twitter perhaps!) that novels set in the present day are being called PRE-APOCALYPTIC. Gulp!